The iPhone XR isn't the only new Apple product launched today. Apple is now selling a USB-C charger for Apple Watch. The 0.3-meter Magnetic Apple Watch Charger is identical in price and design to the USB-A version that’s been available for a while, but adopts the USB-C standard. For whatever reason, Apple is only offering the USB-C Apple Watch charger in the 0.3-meter length. (It still offers the longer 1- and 2-meter USB-A chargers.) That’s possibly an indication that these do not sell so well for Apple, or it might simply mean that other size options will be available in the near future. Apple has sold Lightning to USB-C cables for the iPhone for a while now. However, until now there was not a version for the Apple Watch. It is compatible with Series 1, Series 2, Series 3 and Series 4 Apple Watches. At present, Apple’s mix of ports is confusing for many customers. While its laptops mainly use USB-C, iPhones and iPads are bundled with USB-A to Lightning chargers. According to rumors, the new iPad Pro may ditch the Lightning connector for USB-C, although this still has not been confirmed. 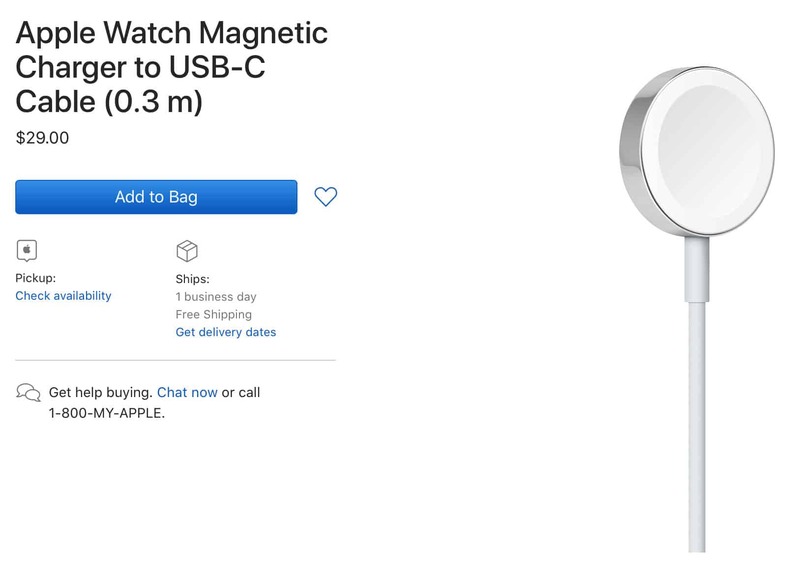 The $29 0.3-meter USB-C Magnetic Apple Watch Charger is currently available for one-day shipping. Expect to find it in Apple Stores as soon as next week.